2016 Ford Focus ST: Will It Baby? It’s not clear to me why Ford continues to make fun cars. Is fun really part of the company’s brand identity? Does it help them with market share? Does every car in the lineup need, like, multiple halo versions? What is happening here? Not like I’m complaining. The Ford GT. The Fiesta ST. The Focus ST. The Focus RS. The Ford Raptor. The Ford Taurus SHO. The Mustang GT350 and GT350R. All we need is a hopped up Ford Transit in the United States and we’ll have most of the cars Ford makes offered in some kind of performance trim. None are terrible and some are so good it makes me hurt a little inside that I’ll never have the money or the garage space to own them. A reader asked if I had any thoughts about the Ford Focus ST as a baby hauler since his wife was expecting to have a baby soon so I ordered one up from Ford. This was not a great personal sacrifice. I’ve driven the Focus ST before and it’s always way more fun than you’d expect for around $25,000, and I always assumed it would baby. The first and most important detail worth addressing is the doors, since three-door hatchbacks are becoming extinct. I’m all for choice, but you know who shouldn’t complain about Ford only offering a five-dour version of the Ford Focus ST? Moms and dads. Having an affordable hot hatch you can easily kid an infant or child in and out of it is a dream come true for some of us (not enough of us, though, as our options are currently limited to the Focus/Fiesta ST, VW Golf, and maybe the Veloster Turbo). When driving a car I always make a list of pros and cons and at some point I wrote down “Looks like a Pikachu” on the pros list. Then, later, I wrote down “Looks like a Pikachu” on the cons list. That’s how I feel about the car. With the new even-more-Aston-y snout and Boss 302 black-over-yellow stripe and paint it definitely looks like the Japanese cartoon version of itself. On the other hand, I’m tired of exciting cars with boring paint and therefore can appreciate what Ford has achieved here. 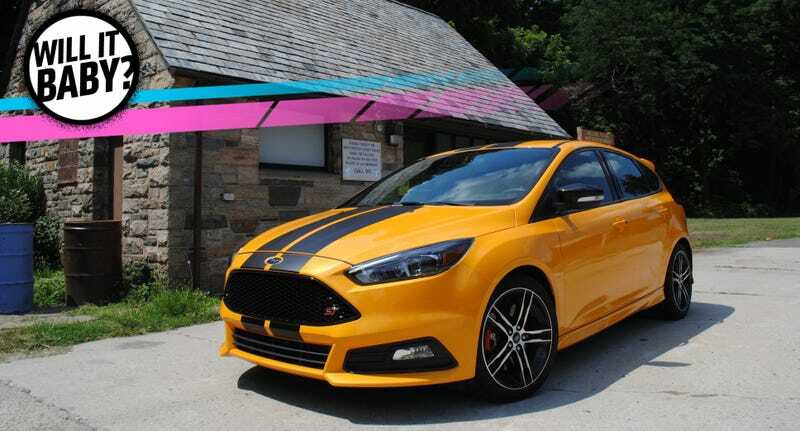 It does draw a lot of attention, but the good news is that the Focus ST definitely has enough juice to back up its aesthetic with 252 horsepower and 270 lb-ft of torque on pricey gas. A 0-60 mph time in the low-to-mid 6s range is quick enough for most and the car handles well, though it’s not as endearingly twitchy as the Fiesta ST. If Ford’s cars were basketball players the Focus ST would be Penny Hardaway and the Fiesta ST would be Lil Penny. My esteemed colleague Mike Ballaban argued that the car was too quiet when he drove it, and while I admit the EcoBoost exhaust is definitely not tuned to sound like the pizza delivery guy’s B16-swapped Civic is that a bad thing? A little aural personality certainly goes a long way and if it really bothers you that’s a very solvable problem. I wasn’t bothered by it. Whether you want a Ford Focus ST or a Volkswagen GTI is something I always thought was decided at birth and I don’t think anything I could write here would persuade anyone to choose one or the other. If, as an infant, your child gently strokes the edge of the crib in appreciation of the soft, environmentally-sourced bamboo they’re gonna want a GTI. If your child tries to play hockey with the Mozart Magic Cube, get ‘em a Focus ST and make their sweet 16 a magical experience. That our commenter wants to jump from a three-door GTI slightly disproves my theory, but I’d definitely argue the five-door Focus ST is a better fit. The car will absolutely baby for one and, at least on short trips, maybe two small children. This is the advantage of a front-engined, FWD five-door hatch. Most of the mechanical bits are shoved up front so the car can sit nice and low and there’s plenty of usable space aft of the firewall. The Focus design finds a nice balance between cabin space and cargo area, offering enough room in the backseat for me to use a rear-facing car seat like the Britax B-SAFE without having to jam myself or the passenger in the dashboard. Bette seemed to like it, although the view outside of the car is somewhat hampered by the way the greenhouse narrows towards the rear of the car. There’s LATCH attachments on both seats and the carseat snapped in easily. I attempted to put the car seat in the middle as it’s the safest place for a baby, but as with most cars this size it didn’t fit as snugly as I’d have liked and thus I went with a window seat. The car didn’t make her spit up, but if it had I’m convinced the leather seems like it would be easy enough to clean. If you’ve got a larger travel system stroller like we use you can fit it in the back along with a few bags stacked on top, although not much more. There’s a mostly useless Sony subwoofer on one side of the trunk that I would personally avoid getting as it takes up valuable space for the accouterment a baby requires. Though I lust after a Focus RS, I could see myself owning this car as one of the reasonable compromises that parenthood makes easier to swallow (let’s move to the near-suburbs, let’s vacation in the Catskills and not Bali). It has enough space and enough power and enough attitude and, frankly, when you’re only sleeping for a few hours a day for an extended period of time “enough” is a great accomplishment.